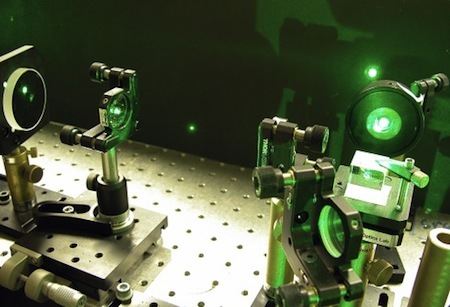 This new tractor beam prototype is able to move small objects 100x the size of a bacterium more than a meter using only the power of light. It was built by researchers from the Australian National University. Science fiction fans recall that the term tractor beam originated in Space Hounds of IPC, the 1931 novel by E.E. 'Doc' Smith. Although he lost the "war of words" with Smith, science fiction writer Edmond Hamilton had the basic idea first - he called it an "attractive ray" in his 1928 book Crashing Suns. From via Physorg; thanks to Winchell Chung for the tip in this story.